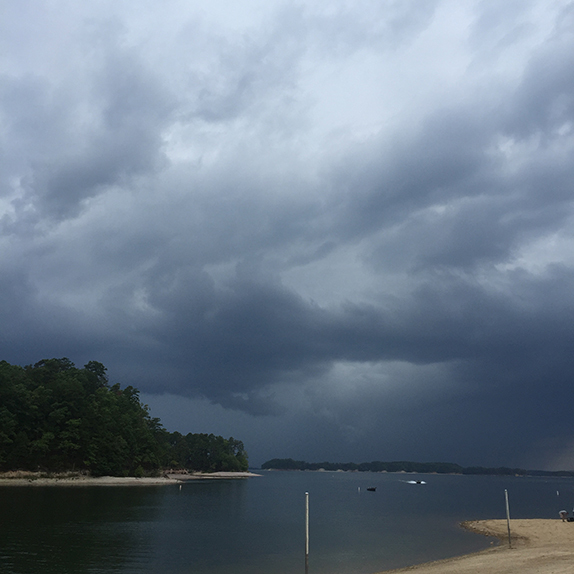 Storm clouds loom over Lake Ouachita on Wednesday afternoon, the final day of practice for the Cup. More clouds are in the forecast for the weekend. In 2007, 81 anglers descended on Lake Ouachita for the Forrest Wood Cup. With a $1 million top prize up for grabs, only one man � Scott Suggs � left satisfied that he�d figured out the sprawling mountain reservoir. In 2011, the field was 57 men. Again, just one guy � Scott Martin � departed Hot Springs, Ark., with a smile on his face having aced the mid-summer brain-bender. Three years ago, 50 anglers started the Cup and when the weekend wrapped up, it was Brad Knight holding the big trophy aloft. The rest went home scratching their heads, probably muttering something about Ouachita�s fickle nature and how one thing worked one day, but not the next or lamenting a lost fish here or there. Welcome to summertime fishing in Arkansas, or most anywhere else in the South. On Friday, 56 anglers � some household names in the sport, some relative unknowns � will set out across Ouachita as the lake hosts the Cup for the fourth time in the last 12 years. So who�s going to be the last man standing this time around? Nice try. It could very well be Martin, who�s one of four anglers in the field bidding to become the first two-time Cup winner. It could be Sheldon Collings, the 20-year-old from eastern Oklahoma looking to get over the sting of a miserable season finale at Lake St. Clair. Heck, it could be Arkansas native Mark Rose, the newly-minted Angler of the Year who finished 3rd at Ouachita back in 2011. It could even be Michael Matthee, a South African who qualified through the International Division at last year�s FLW Series Championship. Bottom line: It�s anybody�s game this week. The key to success at Ouachita in August seems to be not getting too locked in on any one thing. Unless, of course, you�re Suggs and you�ve figured out how to trigger bites with a spinnerbait 20 to 25 feet down near the tops of standing timber where bass congregate in the summer. Or if you�re Martin and you stumble upon a pack of fish stalking bait in 20 to 27 feet with a swimbait. Or if you�re Knight and you�ve managed to pinpoint some submerged blowdowns (likely put there by a tornado) in the back of a creek and you have the willingness to wait out five good bites a day with a dropshot. Those are the exceptions. Otherwise, an open mind might be the most dangerous tool on anyone�s front deck this week, but not too open. While some will live or die following one scent trail, the consensus is that it�ll require a mix-and-match approach over three days to find paydirt at Ouachita. The trick now is figuring out the recipe. Will it be morning topwater mixed with brush piles or probing grass clumps and bream beds? Or will it be stumps and brush? Or standing timber and schooling fish? It could be one combination one day and something totally different the next. Some say that�s the reason Ouachita is the perfect venue for such an event � it presents the ultimate test for some of the top anglers in the sport, forcing them to make snap decisions on the fly with so much on the line. 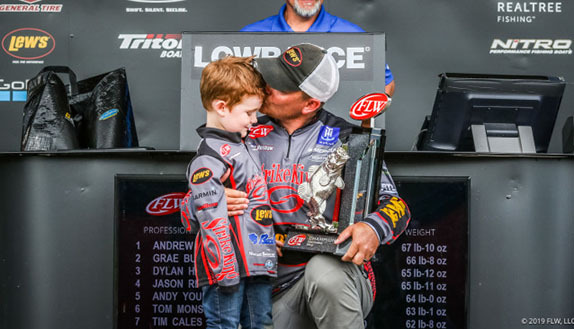 Others bemoan the grind of fishing in the heat and would rather have the championship tournament at a lake where there�s more consistent action (cough, Lake Hamilton, cough). Either way, someone will have to overcome some intense conditions and pressure if they are to experience a career-changing moment early Sunday evening. The water at Ouachita is roughly five feet below full pool and has been steadily dropping through the summer. A line of thunderstorms moved through Wednesday and dumped more than a quarter-inch of rain on the Hot Springs area and another quarter inch was expected to fall as part of another storm system Thursday. That could be the best news any of the competitors could have hoped for as the high pressure that�s been hovering over the lake has made the fishing challenging to say the least. Any amount of cloud cover or wind or rain could trigger some fish to get active, especially those chasing bait to the surface. More thunderstorms and rain are in the forecast for the balance of the tournament so Wednesday could loom large as it was the only day during practice with any significant cloud cover. An afternoon thunderstorm chased the balance of the field off the water, marking a premature end to the four-day practice period. Defending Cup champion Justin Atkins says fishing at Ouachita now is nothing like it was in the spring. �I would think the clouds will do something because it can�t get worse,� said JT Kenney, who�s preparing for his 11th Cup. The previous three Cups at Ouachita were all four-day affairs, but with FLW going to a three-day format in the Cup beginning last year at Lake Murray, what was once a marathon is now more of a sprint. The three-day format will likely prompt anglers to seek out size over quantity, but even that can be a treacherous prospect with things as tough as they�ve been. Here are a couple stats to keep in mind as the tournament rolls along this week. The average weight of the day-3 leader in the three Cups at Ouachita was 41.77 pounds or a shade more than 41-12. To crack the top 10 after day 2, it�s taken an average of 22-15. Maybe the cloud cover helps push those trends higher or maybe they have no effect at all. Stay tuned. Before getting into more about the bite, here's the lowdown on the lake itself. > Biggest factors: Decision-making. Some will try to stick with one thing too long while others will fly by the seat of their pants. > Wildcard: Schooling fish. If you�re fortunate enough to be around them when they break the surface, good things can happen in a hurry. If the Cup were a springtime tournament, the tenor about Ouachita would be much different, but the summer timing of it means trying to figure out the lake at perhaps the worst point on the calendar. It�s hot, the water�s nearly 90 degrees and many of the tournaments held at Ouachita during the summer are night events because that�s when bass are most active under such conditions. Since FLW is unlikely to shift the competition hours around and have a weigh-in followed by brunch, the 56 anglers will have to play the hand they�ve been dealt. That means heading out Friday with the mindset that a myriad of tactics could produce throughout the day. It's hard to predict how bass will behave in the dead of summer at Ouachita, added Davis, who finished 4th in the 2007 Cup. There are no docks or bulkheads to throw at so anglers are left to locate something the fish can relate to. Sometimes, it�s brush or stumps or standing timber. Other times, it�s the edge of a hydrilla clump. �July and August are the two worst months to fish Ouachita because it�s so hit and miss,� he said. �They�re here today and gone tomorrow. You better have more than one plan of attack because finding something that will work day in and day out is tough. Even Kilby said the local anglers struggle to get a firm grasp on how to be efficient during the summer months. Some just wait until sundown. Davis said one element to fishing Ouachita in the summer that gets overlooked, even by locals, is the deep standing timber. Suggs put the puzzle together back in �07, but he�d spent a considerable amount of time on the lake and had a general understanding of where the fish were apt to gang up. Someone who�s seeing the lake for the first time this week might not be willing to investigate that option with so many other scenarios at hand. Most of the timber Davis is referring to resides on the lower half of the lake in some of the bigger creeks. There�s also stands of it in the Ouachita River arm to the west. It may sound easy enough to break down, but Davis says it�s not. Alex Davis said part of the challenge at Ouachita is adjusting his expectations of what a good day will be. If the stars align and someone is able to tap into the fish around the tops of those trees, Davis said it could be the pathway to victory. With temperatures pushing 90 degrees and the fishing mostly a grind, mental toughness is a real component to any successful Cup strategy. Long lulls between bites can be taxing and execution then becomes paramount when there�s a tick on the line. Staying on your toes from the start of day 1 through end of (hopefully) day 3 will be easier said than done. There is no telling how many brush piles have been installed at Ouachita, but there�s a good chance a few anglers will train their sights on them this week, hoping to coax a few key bites from around them. It�s a dicey proposition, Kilby and Davis agree, because of the finicky nature of the fish that tend to hang out around them. Much of the brush, Kilby says, was strategically planted to benefit anglers competing in night tournaments or crappie anglers. With such intense sun penetration during the day, brush any shallower than 25 feet will not likely hold any fish of demonstrable size until after sundown. Davis says the spotted bass, which are smaller on average compared to Ouachita�s largemouth, are more apt to hang around brush and that it�s something he wouldn�t be reliant on. �You�ll find that you may know where 50 piles are, but only two or three may hold catchable fish during the daylight,� he said. 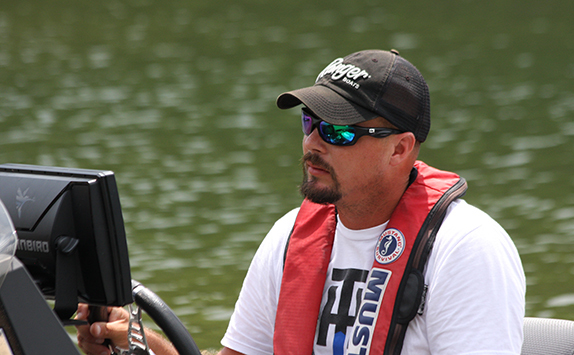 Following are practice notes from a few of the anglers who'll be competing this week. �I�m going to chase those schoolers for a couple hours and then I guess fish deep brush. There are fish in the brush. It�s just a matter of whether you can get them out. You�re liable to fish 10 piles and not get a bite and then all of a sudden you get a bite and it�s a good one. Things just have to go right. If it�s meant to be, it�ll happen. �I�ve gotten bites on a buzzbait and stuff, but I�m not going to run pockets for three, four or five bites. I�ll just fish out and hope I catch one. I�d like to have about 12 pounds a day. I think that will be strong. Losing a 2-pounder could cost you $10,000 here. "I fish Smith Lake a lot and there are lakes in Alabama where they get in that brush good. It just seems like when you get over a pile of brush, you can tell if you�re going to get a bite because it�s active with fish around it. There will be crappie or whatever over the top of it. If you find those, you can get a bite, but some of them you�ll go over and see every limb and there�s nothing there. �It�s pretty tough out there. I�m pretty much committing to fishing offshore for the most part. I know that most of the big fish are probably going to come off the bank, but for the amount of time I�ve done it, it�s not that easy. I�ve had some glimmers of hope fishing out deep and it�s not easy out there, but that�s my best chance to have a good tournament. �It�s bigger than it appears to be. If you thought you could fish all the places on the bank, it�s huge. It�s very time-consuming and it seems very random. It�s a cool lake the way it sets up because people can fish deep or shallow or fish grass. From that standpoint, it�s nice and you don�t see anybody all day, but it�s August. �My PMA (Positive Mental Attitude) is high. As long as you realize you�re not going to get a lot of bites and you�re not going to catch 20 fish and 15 pounds is huge � once you get that through your head, it�s easier to deal with. When you start thinking 10 to 12 pounds is actually decent, it�s easier, but it�s hard to get it through your head when you come from St. Clair or Guntersville and 12 pounds is nothing. After being here for four days, it soaks in that I�m not doing that bad. It�s just that it�s not that good. �I think whomever wins is going to have to catch a shallow fish or two to go along with some deep fish. I don�t think you can fish just one or the other and win. The shallow bites are the bigger bites, but they�re very random. I would be totally amazed if somebody could catch five up there. If I can get a couple places out deep where I know there are actual legitimate schools of fish, I think a limit would be pretty simple, like a 15- or 20-minute deal, if I can get them to myself. But you�re talking a 7- or 8-pound limit. That�s my plan � try to get five and run the shallow deal the rest of the day and try to catch one or two. �I have fished so many brush piles this week I�m tired of throwing at them. You can get a bite or two out of them and I�ve caught a couple largemouth out of them, but you�ll fish 40 piles and get two bites. You can catch spots, but they don�t matter. �It�s a little overwhelming with all the structure and places they can be. They�re pretty spread out. I don�t have much confidence in the deep stuff so I stuck shallow. It�s what I like to do. That�s how I feel the most confident going into it. I�ll maybe start on some schoolers and beat the bank the rest of the day and hope to get five bites. �I�ve thrown at schoolers and caught two keepers, but both were line burners. To me, it�s definitely not something to count on. I was here in May when the water was 4 feet higher and it was easy. You could almost call your shot doing down the bank. Two weeks ago, it wasn�t much different than it is now. You could catch a few along the bank, but it seems to be even fewer now. �I can�t find �em suspended and there�s not a ton on the bank. You have to think they�re somewhere on the lake. There�s a bunch of fish in here and I�m sure someone is going to make us all look stupid. It just seems no matter the time or location, there�s always something more predominant and I�ve haven�t seen anything that gives me a hint what that is. �(Tuesday) was day 8 for me here in the past month. I know what I�m doing Friday, but I don�t know how it�ll work out. I�ve fished everything imaginable. Staying focused is the big key. It�s a day-and-night difference when it�s cloudy and rainy here. Before cutoff there was a day like that and I caught 15 keepers that day. When this high pressure settles in, it�s impossible to catch a keeper. 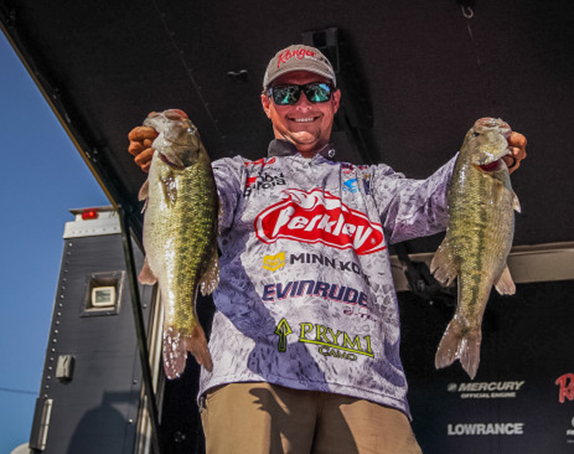 Jeff Sprague is confident he's around enough bass to be competitive this week. Whether they'll bite is another story. �I have found absolutely nothing. I threw topwater all day Monday and caught a 4-pounder and a 2-pounder. I fished deep Sunday and caught one 2 1/2-pounder. I also found several schooling places, but they�re all really little. I�m headed in the right direction, I think. �It�s not been real good. I�d never seen Ouachita before Sunday. I came in blind. I don�t know where guys caught �em before, but several guys have a lot of history here. At the same time, I don�t think the lake is fishing well. I can�t imagine that it�s fishing as well or better than it did a few years ago. I�m not seeing many bites or fish or brush � all of those deals, I�m not seeing any of them being good. Guys may find stuff that hadn�t been done before, but I think it�ll be a junkfest grind. �It�s not as good as it was the last time it was here. I don�t think the schooling fish are as big of a factor as last time. The bank has been beat to death by locals and by us. The deep bite, if you can find something out there, you�re more apt to find walleye or white bass. So here we are, looking at 11 to 13 pounds being a good bag of fish. �It�ll be interesting to see what the cloud cover will do. Cooler weather will change things. When the wind changes like it�s going to change and the pressure changes, these fish just sitting out there suspended might move up and be catchable, which means my weight predication may be off. We welcome the change, however, a guy is going to have go back to the drawing board. 1. 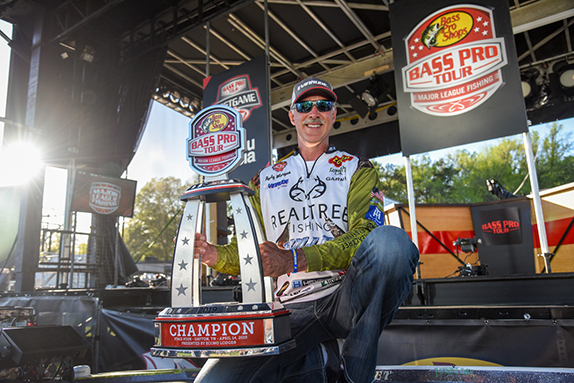 Bryan Thrift � Arguably the best angler in the game without a Cup or Classic title to his credit. The law of average dictates he will win a Cup eventually, especially if he keeps putting himself in contention entering the final day. He�s been a top-7 finisher at the last six Cups and has finished lower than 15th just once in 11 Cups. 2. Cody Meyer � Has seen both ends of the spectrum of the Cup at Ouachita with a 7th-place showing in 2011 and a 31st in 2015. Coming off an eighth straight top-15 finish in FLW Tour points, the Californian has the versatility needed to unlock Ouachita�s finicky bass. 3. David Dudley � He�s lacking a top-end finish this season, which is uncharacteristic of the three-time AOY, but he seems to click with Ouachita, no matter the time of year. In five previous visits to the lake, he�s finished as high as 3rd (2010 FLW Tour) and no worse than 16th (2002 FLW Tour). 4. David Williams � Deep, clear reservoirs don�t faze this North Carolinian, who had a dazzling debut season on the Tour. He favors a spinnerbait scenario, but is just as adept at picking over brush piles, too. 5. Brandon Cobb � He�s 3-for-3 as far as top-10 finishes go in the Cup, including a 3rd at Ouachita in 2015. The big stage doesn�t faze him anymore and he says the dog days of August are among his favorite times to be on the water. 6. Michael Neal � This is Cup No. 6 for the Tennessee pro, who has established himself as a persistent contender. He�s been in the mix on the final day of Tour events and at the Cup too often, it seems, for the chips not to fall in his favor sometime soon. He�s got the mental makeup to withstand the grueling spells between bites and that�ll be a big factor this week. 7. Scott Martin � His family has strong ties to this part of Arkansas, which added a lot of meaning to his 2011 Cup triumph. Nothing would mean more to him than to win a second Cup on the same lake. He�s fresh off a 3rd-place finish in AOY points and an 11th straight season with at least one top-10 finish. 8. 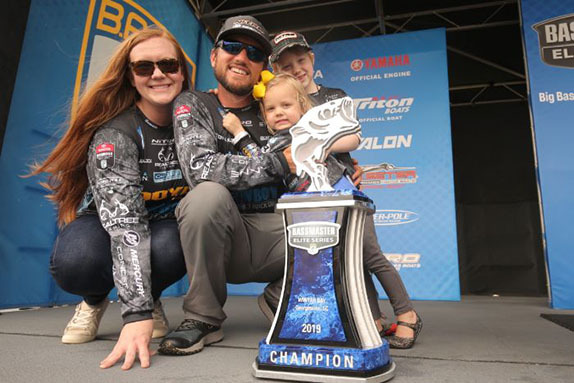 Matt Arey � The former Cup winner (as a co-angler in 2006) overcame a 151st-place finish in the season opener to qualify for his eighth straight Cup as a pro. Arkansas has been good to him before with his two Tour wins coming at Beaver Lake. He has the skillset to decode Ouachita and finished the season on a roll with three straight top-20 showings. 9. 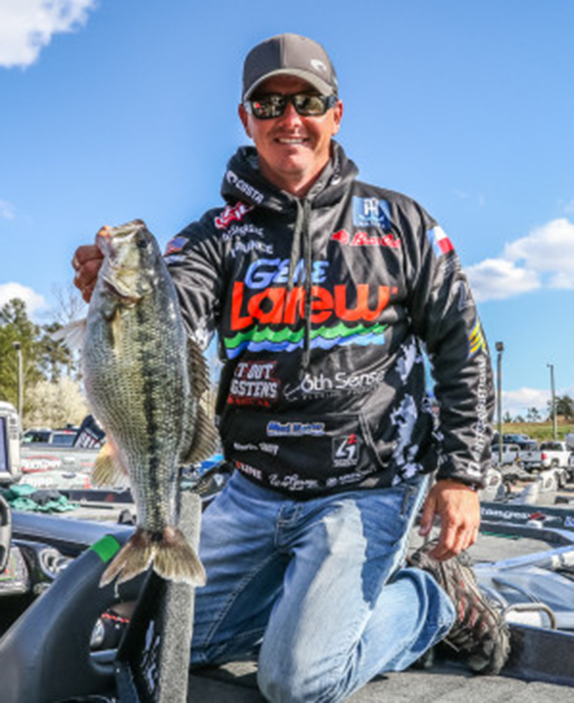 Shane Lehew � Was in the mix after day 1 at Lake Murray a year ago, but faded to 19th. This is his 4th straight Cup and the quiet Lake Norman ace could be poised to make a big splash at Ouachita. 10. Mark Rose � What would cap off an AOY season better than a Cup title? How about a Cup title in his home state. Ledges won�t be mentioned once this week, but Rose has proven his versatility over the years and that will be a dominant theme at Ouachita. > Anglers will launch at 7 a.m. CT all 3 days from Brady Mountain Resort and Marina (4120 Brady Mountain Road in Royal, Ark.). Daily weigh-ins will commence at 5 p.m. at Bank of the Ozarks Arena & Hot Springs Convention Center (134 Convention Blvd., Hot Springs, Ark.). The Forrest Wood Cup Expo, to be held at the Hot Springs Convention Center, will be open from 10 a.m. CT to 4:30 p.m. Friday through Sunday.